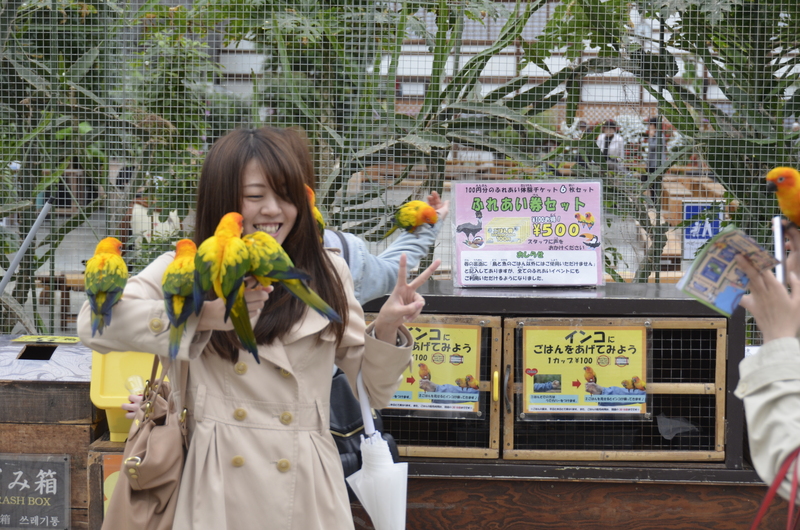 On two separate occasions during our trip we were taken to bird and flower amusement parks. I don’t know if such parks exist in other countries, but this was the first time I’d seen anything like them. One was near Mt. Fuji the other in Kakegawa, and they were remarkably similar in layout and presentation. I got a sense that these exist all over Japan, and I wonder if they are part of a chain. Here is what we experienced. 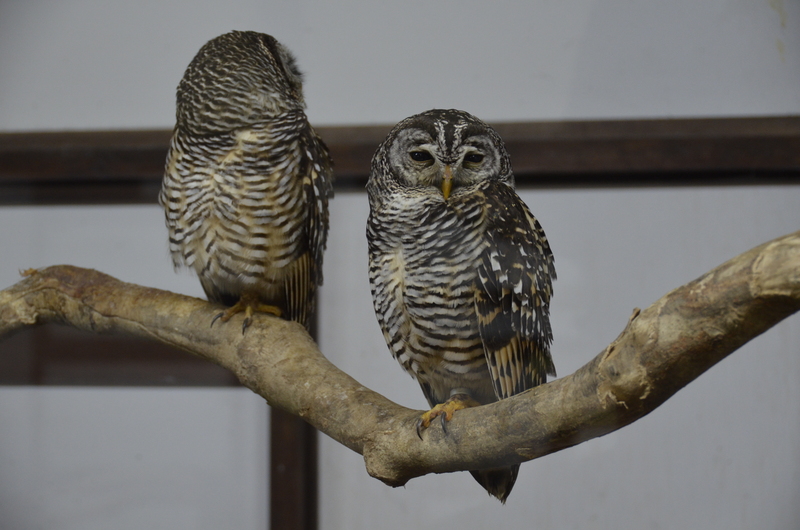 After paying our admission, we were first presented with a row of cages containing many different species of owls. 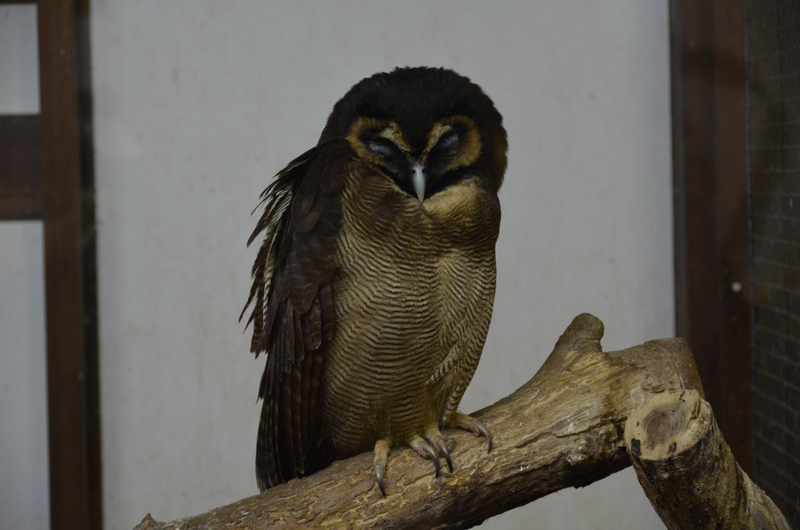 I have never seen so many different kinds of owls, many from various regions of Asia. The variety of size and markings was striking. 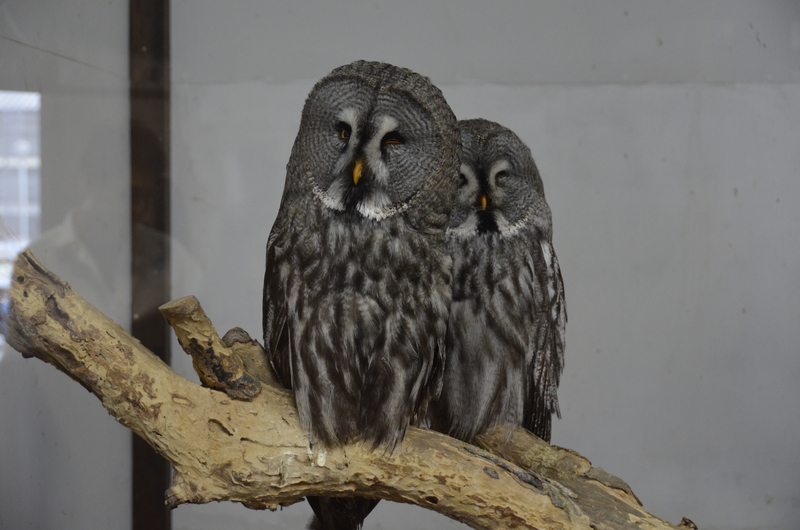 Several were the largest owls I’ve ever seen. 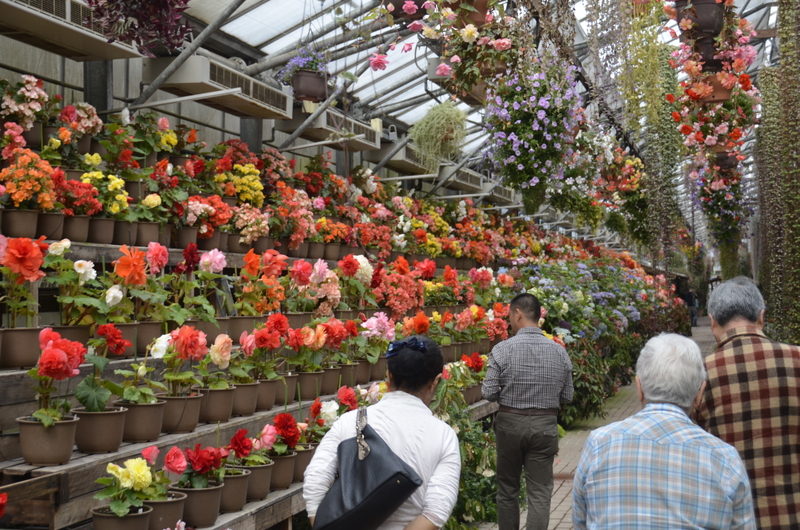 After marveling at the owl display, we went through double doors and were assaulted by an explosion of color. 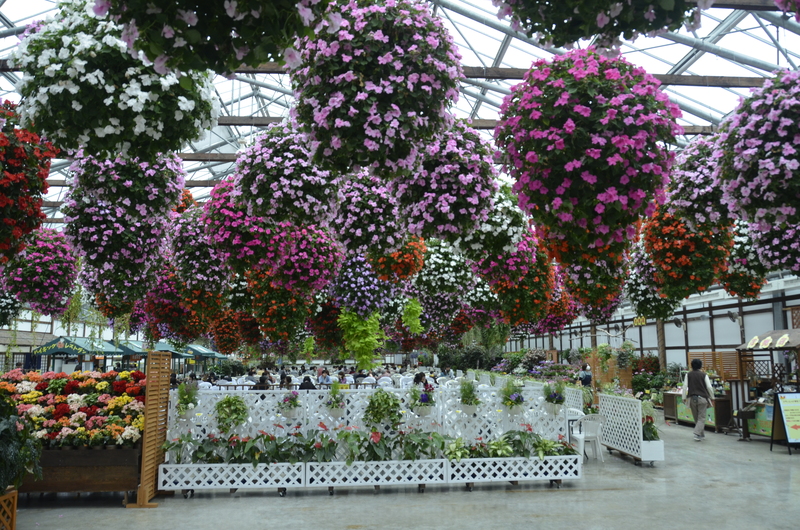 Hundreds of flowering plants hanging from the ceilings, climbing walls in terraced planters, blanketing tables and edging walkways, engulfed and surrounded us in bright color and fragrance. 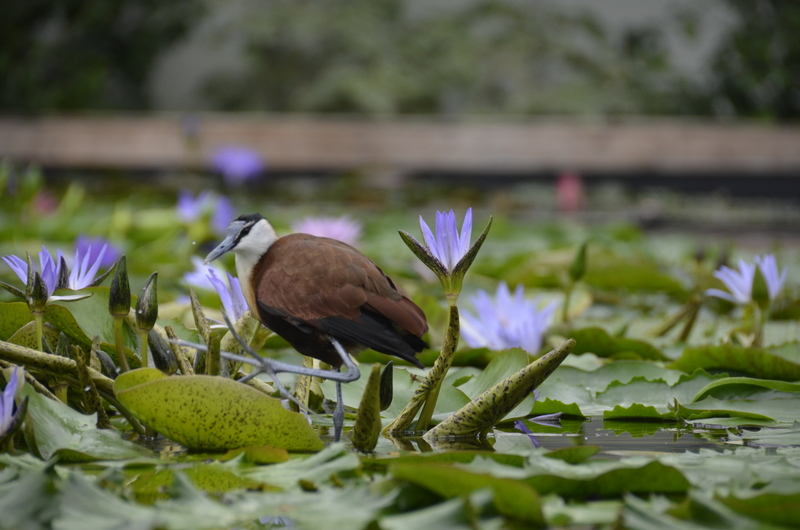 Turn one way and there was a lengthy, above-ground pond with fish, lilies and lotus in full bloom, and water fowl walking deftly across the lily pads. 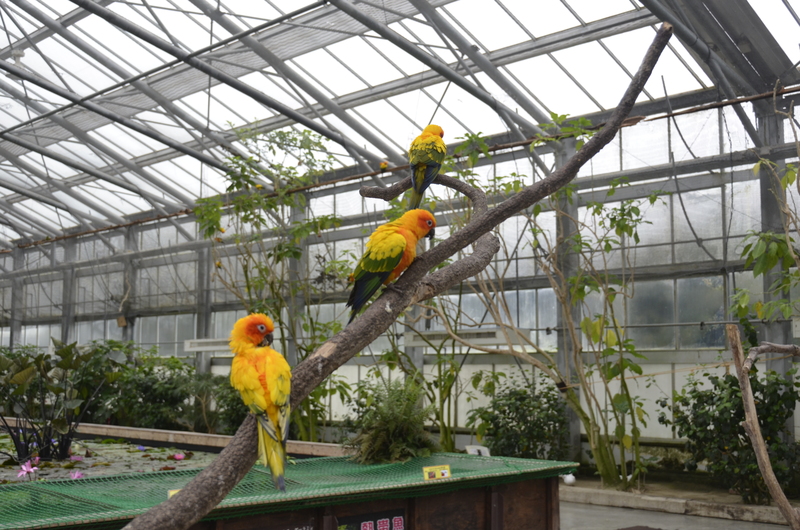 Turn another way and large, walk-in aviaries hosted brightly colored and raucous tropical parrots, lovebirds, parakeets, and more. Warning signs at the aviaries recommended visitors remove their earrings because the birds are prone to bite and steal them. I wear stud earrings and foolishly assumed they wouldn’t pose sufficiently attractive targets. Bad move. 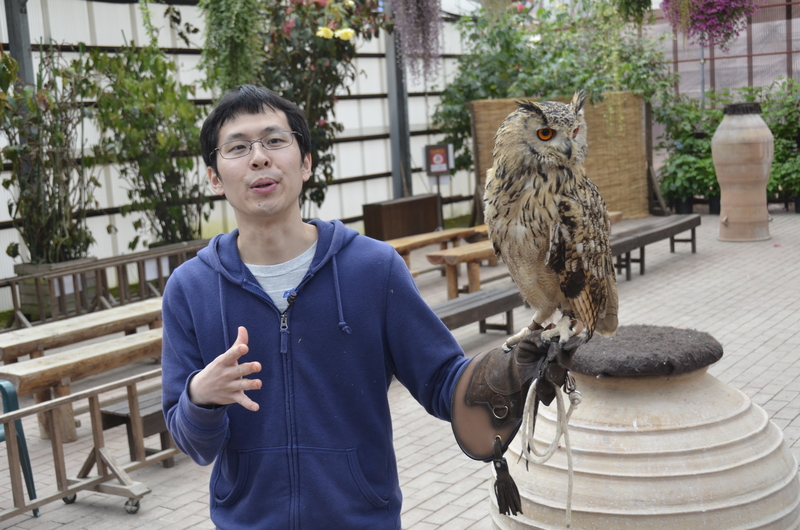 One medium-sized bird landed on my wrist and quickly worked his way up to my shoulder. Before I knew it, he had reached forward with his beak and popped one of my stud earrings right out of my ear. I barely felt it. He then flew away and landed on a branch just beyond my reach. I watched in horror as I saw him bite and twirl the earring in his beak, trying to extract something edible out of it. I wasn’t as worried about losing an earring as I was by the thought of the bird swallowing a pointed metal object. I kept trying to coax him back onto my finger, but he danced just out of reach. Finally I was able to reach close enough that he felt annoyed or intimidated, and he leaned forward to bite my outstretched finger. Out fell the earring, which I quickly retrieved from the floor. We searched in vain for the stud backing and finally gave up. Lesson learned. 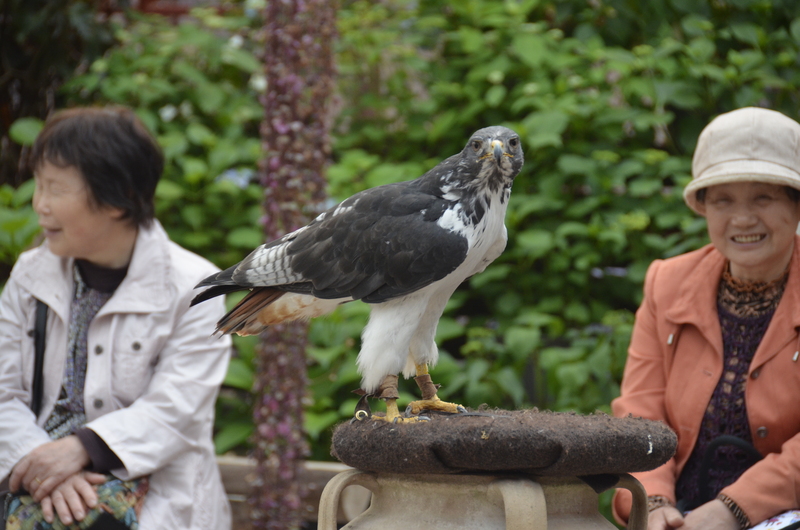 Another feature of both of the bird and flower amusement parks we visited was a raptor show. 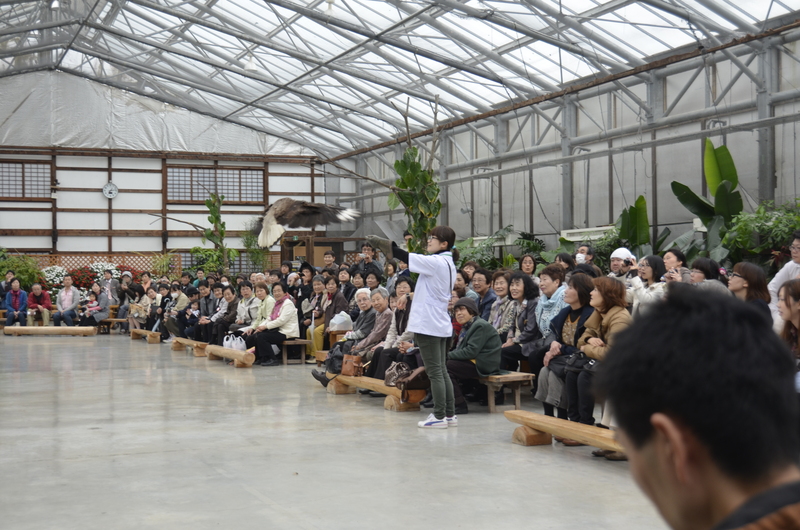 Benches were set up for people to watch as trainers brought out various owls, hawks, and eagles that would, on command, fly from their perch to the trainer. 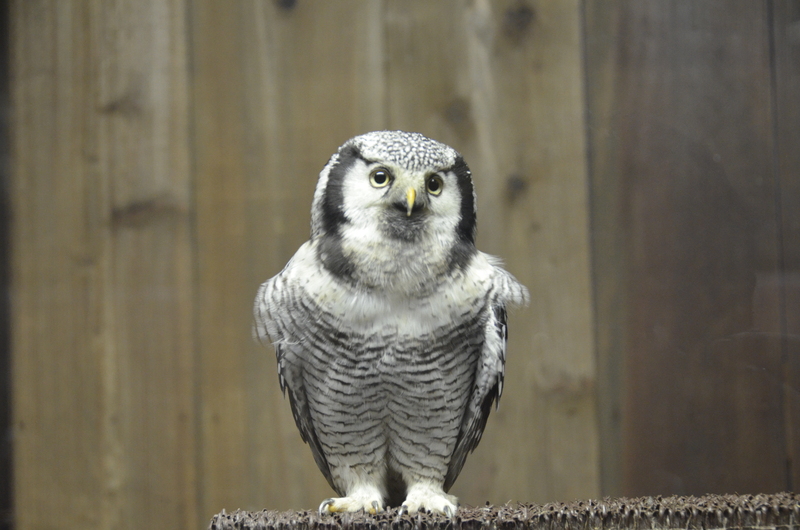 The trainer would return them to a perch, walk to another area of the arena, then call the bird to him. Much to the viewers’ delight, everyone got to see the birds fly from different angles, and a few lucky ones saw them fly within inches of their heads. 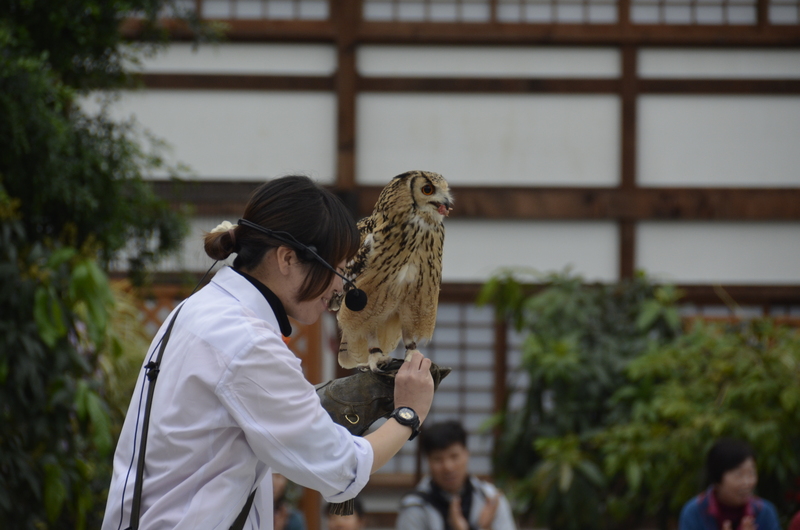 After the show, people were invited to take pictures with the large raptors for a fee. As with everywhere else, the premises were kept remarkably clean. Given the constant traffic of birds flying and waddling every which way, the staff had to be on their toes to clean up the inevitable droppings. 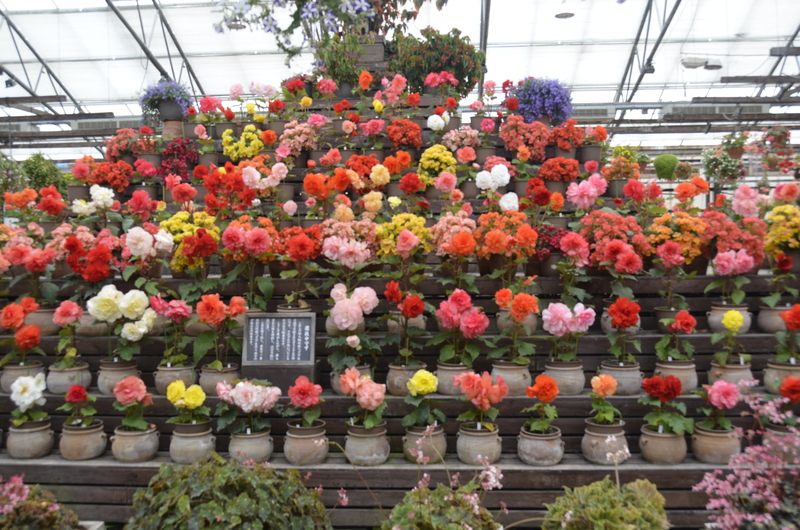 Also, the rows and rows of flowers required regular watering and trimming: They all were in beautiful bloom and I never saw a yellowed or dried-up leaf, stem, or bloom.